Ace Home Inspection, LLC (license #849) was established with the mission of educating and protecting property buyers in Washington. That mission continues to be a driving force through today. Ace Home Inspection, LLC has always put the interests of our clients first. We do not have any “special” relationships with real estate agents, mortgage brokers, or appraisers and always give our clients the option of being on the premises during the inspection. Ace Home Inspection, LLC highly recommends that if you can attend the inspection, then you should be there. This is why we are one of the areas most respected property inspection companies. We use cutting-edge technology including thermal imaging cameras to bring you the most comprehensive inspection results. We are experienced with both structural inspections and pest inspections. We understand the needs of today’s investor and always know what to look for in an investment property. We also know how important a home is. We make sure your house can be the home of your dreams. Ace Home Inspection, LLC was founded by Nick Mello in 2010. Nick has a wealth of knowledge and experience in all facets of property inspection. Ace Home Inspection, LLC has never waivered in our commitment to supporting communities. Nick Mello, Owner, has been involved in many charitable causes and civic organizations over the years. Ace Home Inspection, LLC believes in supporting the community. Building communities through responsible business is what we do best! Ace Home Inspection, LLC currently only schedules two inspections per day, so no job is too big or too small. We believe that over booking can jeopardize the quality of our home inspections and attention to detail. We have a large assortment of professional equipment, including infrared camera’s and advanced moisture detectors to locate certain problems naked to the human eye. 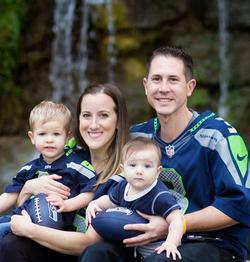 When Nick is not performing an inspection, he likes to spend his free time with his wife and sons. Nick is a member of ASHI (American Society of Home Inspectors) member #252922.